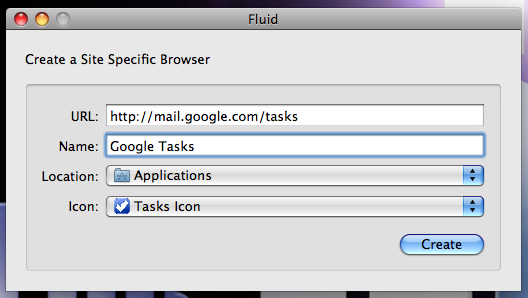 My best and most recent tech find for Mac is Fluid. Fluid is an application that allows you to create standalone desktop versions of your favourite web apps such as Gmail or Twitter. Neither of these appealed to me as I have Gmail synced with Mail on my Mac, and on my iPod Touch (I also sync Google Contacts, Google Calendar and my school Outlook account) and I use TweetDeck to keep up with my PLN. However, there were some web based apps that I felt would be great to have on my desktop due to the fact that it would be good to be able to view them within a separate interface. What’s more after doing a little more research I found that if I used Fluid to create apps I would be able to make use of user scripts to tweak them – that sounded great, so I decided to begin with Google Tasks as I am always looking for ways to improve my organisation and productivity. And here it is. 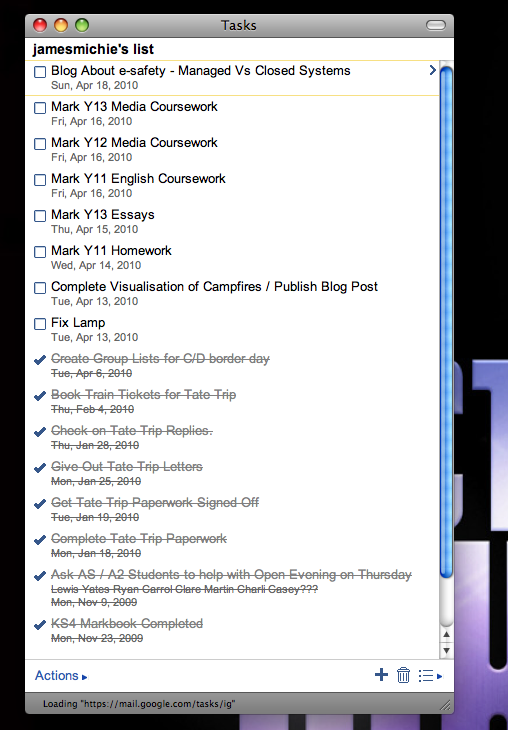 It looks clean, signs in automatically and everything works: Adding tasks, adding info, marking when complete, syncing with Google Calendar and therefore Ipod touch. If you would like to do this you need to download Fluid. Once installed, open Fluid. You will see a dialog box (see below) into which you need to type or copy/paste the following URL: http://mail.google.com/tasks. Name the app Google Tasks. Keep the location as Applications. Download an icon to use, I chose one created by Max Headwound on Flickr (image below), found on the Flickr: Fluid Icons Pool. Then click “Create”. You will see a new dialog box asking you to launch the app. Voilà, you are done! 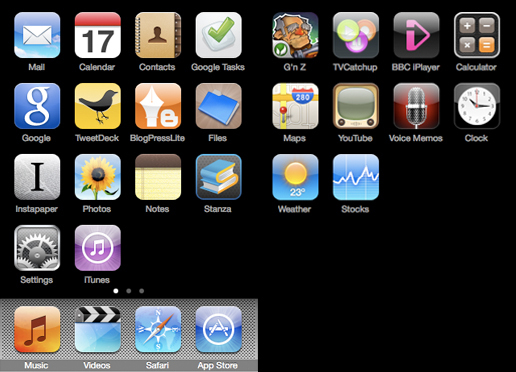 You can then drag the app from the Applications folder to the dock. 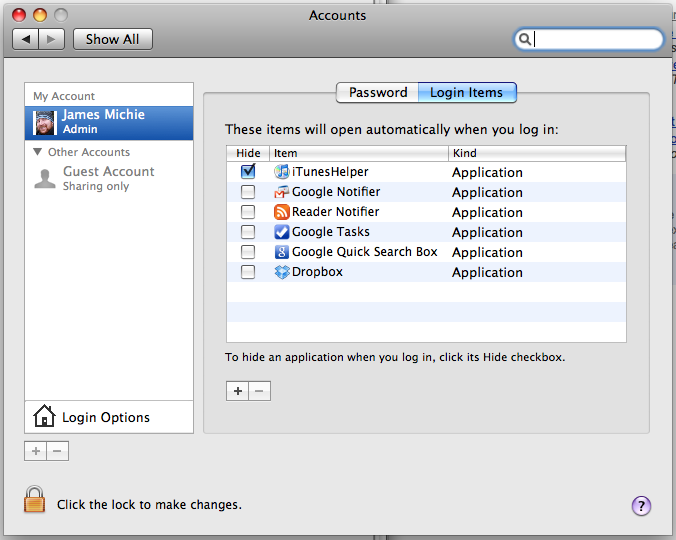 For ease of use I also added my newly created Google Tasks app to my login items so that it would load automatically when I boot up my Mac. To do this go to System Preferences / Accounts / Login items / Click the + symbol and select the Google Tasks app from the Applications folder. There are also some nice icons available at IconsPedia, choose the icon that suits you! As a Mac user image is important to me so selecting the right icon was as important as choosing which web apps I would turn into desktop apps. 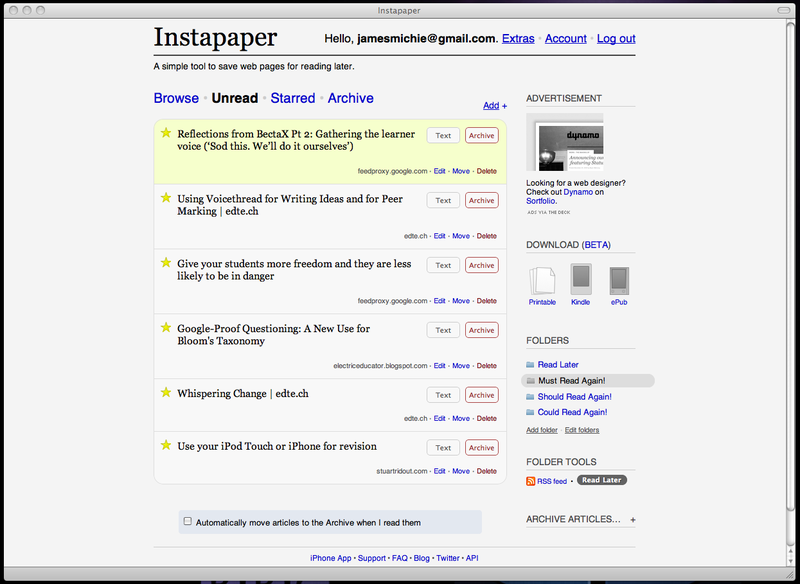 My next web based app that I use every day was Instapaper. The process is the same as before using the following url: http://www.instapaper.com/u. If you have not used Instapaper before, I highly recommend it. It makes up an integral part of my web workflow, something I plan to write more about in a future post. 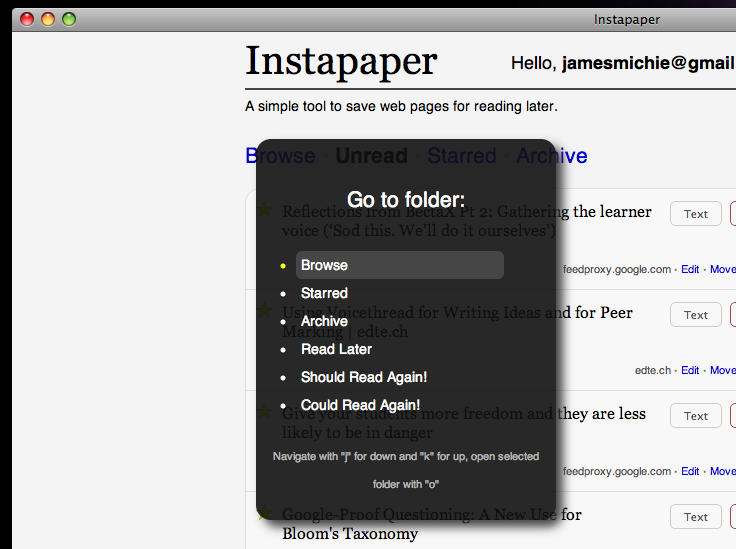 Instapaper allows you to store web pages and articles that you find to read later. It makes use of a bookmarklet to do this but if you are using the beta build of Google Chrome you can use the Instachrome extension. 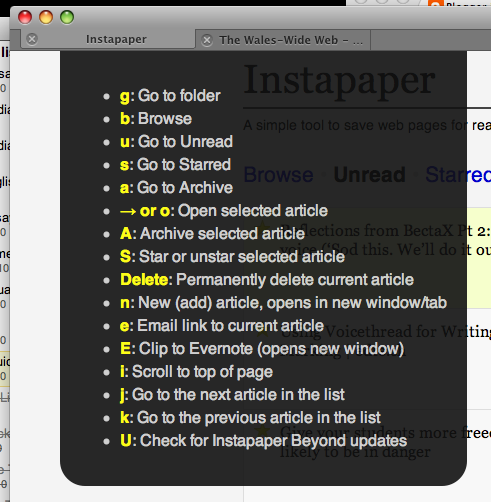 I have been using this extension for almost a month now and it makes adding pages to Instapaper a breeze. Instapaper comes into its own if you have an iPod touch as the articles can be synced for offline browsing. As a serious user of Instapaper I recommend the pro version, I use folders and it helps to have them synced, saves having to repeat actions later as everything can be done from the iPod. I didn’t stop with this one in simply creating the app I also installed a user script called Instapaper Beyond. It’s a script for Fluid created by Brett Terpstra which adds keyboard navigation and some special features. For example: (alt+g) brings up the “Go to folder” menu – just one of the very useful functions offered in this script. There are many more functions that make browsing Instapaper very enjoyable all of which can be controlled by the keyboard. Pressing (h) will bring up a full list of them. And that’s it. Two apps that help improve my productivity and workflow when surfing the web. I think that I am going to create a stand alone Google Reader app as this makes up another integral part of my web workflow. If you have any questions or want some advice about this process please e-mail me or tweet me @jamesmichie. Comments are always welcome. New Blog! New iPod! An Update! Since this whole blogging thing started with my new iPod touch I thought that it would be fitting to make my final post for week one of “James Michie…a 21st Century Educator” an update on my progress learning to use it, the apps I’ve added/deleted and my first game download. The image above is my current set of apps and the layout that I am currently working with, since my last post I have done the following. I realised that apart from “Tasks” there was no major benefit to me having each Google feature as a separate button – I can access them all from within the “Google Mobile App” and once I am in I usually leave them loaded up so that I can simply return to them at leisure within Safari. Instapaper is even more useful to me now that I have access to it on a mobile device. I have been reading even more, increasing my productivity and in turn filling up more of the free space in my “brain-attic“. Having moved from WordPress to Blogger I have installed but not used the “BlogPressLite App” – it has gained mixed reviews but I will try it out sometime in the near future. I have read two whole books, downloaded with “Stanza“. I have used the Notes App twice when asked to go pick up some odds n’ ends from the shops. I have gotten somewhat annoyed by the fact that if I check my mail using the Mail App that it leaves a copy of the message in the All Mail folder after I have deleted it from the Inbox. I have watched bits of programmes on both BBC iPlayer and through “TVCatchUp“. Although, I have not settled with myself the idea of watching a whole show on such a small screen – after all I am at home and have a 17” Macbook Pro that serves my online viewing pleasure very well. I deleted “Wikipanion” after I realised that learning the touch-screen finger swipes to move, zoom in/out, select all, copy+paste was not that hard, using Wikipedia on Safari was not that difficult after all. I am going to stick with “TweetDeck” – it is working as well for me on the iPod as it is on my desktop. Finally, I downloaded my first iPod touch game. I have not really played a computer game since university so this was a treat. My first computer when I was just five years old was a “ZX Spectrum 128k” (the one with the built in tape deck) – its bread and butter was platform games. So I went for “Ghosts’n Zombies” a single player-platform game with plenty of shooting, lots of bleeps and squeeps and nice cartoon-styled graphics. It makes good use of iPod touch’s “accelerometer” and I have enjoyed playing it – while it’s a new game to me and the input method is very different to using a joystick or joypad it was an almost nostalgic experience. Well, that is all for this week. I have enjoyed exploring and learning to use my new iPod. Being back at school next week will give me the opportunity to push one or two of its features further inside the classroom and during meetings. It is my hope that it goes someway to furthering my efforts to be paper-free! I can’t really call myself “…a 21st Century Educator” if I’m still reliant on pen and paper, now can I? Posted on Saturday, 20 February 2010 Friday, 18 November 2011 Categories TechnologyTags apps, blog, games, gaming, google, instapaper, iPod, reading, Technology, tweetdeck2 Comments on New Blog! New iPod! An Update!